Have you heard of the Environmental Working Group’s ‘Dirty Dozen’ and ‘Clean 15’ lists? They highlight the 12 fruits and veggies that are tested, and have the most pesticide residue on them. In contrast, the ‘Clean 15’ have the least amount (which is not to say no residue, necessarily…). I found the book ‘Container Gardening for Health: the 12 most important Fruits and Vegetables for your Organic Garden’ to naturally segue from my interest in the above lists, and give me a ‘go-to’ guide for how to make it happen – right in my backyard. As you’ve read, I’m building a garden from the ground up, and early on in my new journey had checked out this short book from the library. It reinstilled in me the idea that container gardening is not ‘giving up’, but instead is a realistic way that I can still have a garden, while I’m taking time to plan my permanent garden. For all those who are well into container gardening and consider the ‘giving up’ comment mean, consider me slapped for my effrontery. I stand corrected, and container-happy. Thanks, Barbara Barker, for a great book! It combines practical knowledge, varieties for various climates, and cultivation and harvesting tips. Complete yet concise. 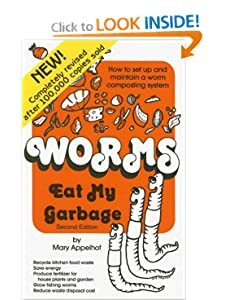 Worms Eat my Garbage, by Mary Appelhof, is a lovely book…..if you don’t mind reading about worms. Worms are nature’s efficient composter, lowly and despised by some, yet ultimately – necessary for our very survival! Truly! The book shows simply how to set up an maintain a worm composting system, also known as ‘vermicomposting’, with simple, inexpensive ‘equipment’, and a little know-how. Worm bins can be keep indoors or outdoors, and can help you to have a productive and healthy garden. Worm castings are one of the best fertilizers known to us, all thanks to Red Wigglers! 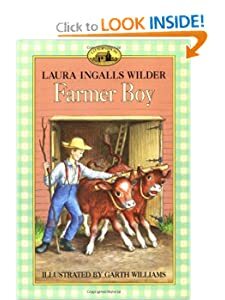 While I’ve shared with my husband and family my desire to give vermicomposting a try, I also remain on the look-out for books that can communicate how cool this idea is to my kids (you’d think 4 boys who like to play in the dirt would naturally take to this idea? I guess they like arachnids better…). 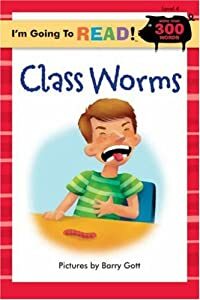 One such book we recently read was “Class Worms”, with pictures by Barry Gott. A classroom teacher brings red wigglers to class and the class performs various experiments to learn more about worms. Not all the class is thrilled about having to handle worms, but all gain an appreciation for the lowly wiggling creatures by the end of the day. This winter, for us, has been long, and made longer by a recent blizzard, and two days later, another dusting of heavy wet snow. And, the book delivers on both its primary and secondary titles. I challenge anyone who has a poor opinion of raw milk to read this book with an open mind! While I myself am a raw milk drinker and advocate, I learned so much about the early history (ancient history, really) of milk, the struggle for clean and reliable milk that led to ‘certified’ milk and pastuerized milk, the role of milk in the prevention of disease, and how the ongoing struggle to ensure access to consumer choice of raw milk is a convulted case of ‘follow the money’ at best, and under-handed politics at worst. 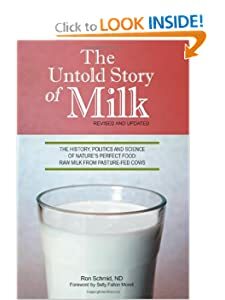 Anyone that thinks milk is boring would do well to read this book, that, while extremely informative, and at times even scientific, is by no means dry reading. I think among the epiphanies I noted while reading it was that the advent of pasteurization in the early to mid 1900’s was not a conspiracy aimed at ending the sale of raw milk. It had noble aims and goals, and accomplished some of them. In large cities, such as New York, the number of people, many of them immigrants, who desired milk for themselves and their children, outweighed the resources to safely deliver raw, or pure, milk to them. As a result, so-called ‘swill dairies’ grew up alongside of whisky distilleries, the cattle being fed and housed un-naturally, that is on the leftover mash of the whisky-making process and confined in pens where they stood and rested in their own excrement. Milk, in its raw state, in this condition, was unsafe. On the flip side, physicians continued to advocate for access to raw milk, so that their patients could truly heal and receive nutritious food. The physicians of this time so believed in the healing power of pure milk that they inspected dairies and certified them independently, asking the dairy farmers to sign an ethical code, and adhere to safety and cleanliness standards. The ‘certified’ dairies the physicians endorsed were generally outside city limits, and couldn’t provide for the needs of all. As a stop-gap measure, I would say, milk pasteurization entered the picture, rendering the swill-dairy milk sterile. However, forever in the minds of the public, continuing to this day, we confuse ‘sterile’ with ‘nutritious’. Take a chance and read this book! I’d love to hear what you think of it. It reinforced my own desire to continue to advocate for the right to choose the milk I drink, and for the state or national government to protect and defend my right to do so – though sadly, even in my state of North Dakota, the legislature is considering a bill to make it much harder to have access to raw milk. Perhaps if each legislator even read the first three chapters of this exciting tome, the education they receive would ensure that no further bills of this nature be considered. Some fermented things are quite easy and quick to make. Take these carrots, for instance. I started 2 different fermented carrot projects yesterday. The total time required of me was 15 minutes (I prepared these both as my Lundberg Italian Herb Risotto was simmering away on the stove), and, granted, the fermented carrot sticks take a couple of weeks to ferment, but my net hands-on time was pretty minimal. I was introduced to the idea of various forms of fermented carrots first through the book “Nourishing Traditions”, but actually tasted some when my friends, Drs. Todd and Molly Ferguson, naturopathic doctors at Prairie Naturopathic in Moorhead, MN, gave me some of their own homemade grated ginger-carrot blend. It was quite zingy, and I ‘bookmarked’ it in my head, to try at some point. Basic recipe for fermented grated carrots (Thanks to The Nourishing Cook): grate carrots (I didn’t peel mine, as they were organically grown, but I think I would peel them if they are conventionally grown) to equal about 2 cups. Add 2 tsp. salt (or, a combination of salt and whey. I am out of yogurt, do didn’t have whey. Take a look at the link to learn about whey quantities). Grate ginger – around 1 Tbl or so – or to taste. I would err on the side of starting out with less ginger, and then adding more in future batches, unless you’re a super-mega-ginger-fan. Like the process for making sauerkraut, you mash this all up, and let the salt draw out the natural juices. It helps if its in a slightly warm-ish place, but not hot. I think due to our April Snow Storm (can I just say, UGH! ), my kitchen was on the chilly side, and I didn’t have the patience to wait for all those natural juices all day. I left the mixture out a good couple of hours before I put it in a clean pint jar, and topped it just to the top of the carrot-ginger mixture with pure water. I capped it with a clean jar band and lid, and let it on the looser side of tightened. You want gasses to be able to escape during the fermenting process. This can be left our 2 – 3 days, then put in ‘fridge or cold storage area. Fermented carrot sticks were even easier (and I used this recipe from the Cultures for Health website – excellent e-store, and excellent resource!). Slice carrots into sticks. Dissolve 2 tsp. salt (non-iodized salt) into 2 1/2 c. water. Pack carrots into clean quart jar and pour salt water over the top. It is best if the carrots are submerged and not floating. If they float, cut up a few more to pack ’em in, or adjust them so the floaters stay put. Cap loosely with a jar lid. Let them sit on the counter in a slightly warm place for 2 – 3 weeks, then put in cold storage or ‘fridge. I thought it was interesting, yet makes sense to me, that the grated carrots fermentation process was much shorter. The whole sticks take a longer time to ferment and get all that good enzymatic action happening. I would imagine it has to do with the releasing of the natural juices, and the surface area difference. Lots of surface area in grated carrots. How do you eat these? The whole sticks can be snacked on, or added to things where you want a bit of a crunch, like a salad. Don’t cook ’em, as you’ll destroy the beautiful work done on the counter top. The grated ginger-carrots can be used also on top of a salad, in a sandwich, as a garnish or condiment with meat (esp. with roast beef, yum! or chicken. I think it would taste fabulous alongside a chicken stir fry). And about that Cod Liver Oil: Now, I have not, nor do I imagine I will any time in the near future, attempt to MAKE my own fermented cod liver oil. I’ll leave that to the professionals at Green Pasture, who make my brand. This is a supplement we just started taking recently. I’ve read about it, and thought about it over the last year or two, and just never took the plunge until recently. It’s a little pricey, but from people ‘in the know’ – healthy individuals, on the more natural side of things – taking cod liver oil is like getting a flu shot (without the potentially nasty side effects, one of which being, the efficacy of flu shots is questioned by the CDC itself! Not exactly a winning endorsement). But, besides that, *fermented* cod liver oil had a great ratio of Vitamin D and A, which is important. And, you get the additional enzymatic benefits of fermentation, not to mention omega-3s present in sea critters! The taste? I get the ‘mint’ flavored variety, and we call it ‘gum juice’ (as much as to entice myself as the kids). To me, it tastes like when you just have spit out your gum, and you still have minty-gum-flavor in the your mouth. Not unpleasant. I do have to say, I can’t take it on an empty stomach, so when I administer the ‘gum juice’ to everyone, its usually right after breakfast, or, if I forget, lunch. I don’t take it every day, but probably 3 times a week. Why fermented? Simply, because its the traditional way. You don’t get nearly the same benefits, and there are even some causes for concern when the oil is not fermented, and by what process it is made. In non-fermented oil, vitamins are removed, and added back in. (Think pasteurized milk..more on that in a book review to come…)In general, and with very few exceptions, traditional food processes are healthier. You can learn more HERE. The review of this book may seem, to some, untimely, as we’re now (at least here in North Dakota) fairly rapidly coming out of winter, and on our way to spring. 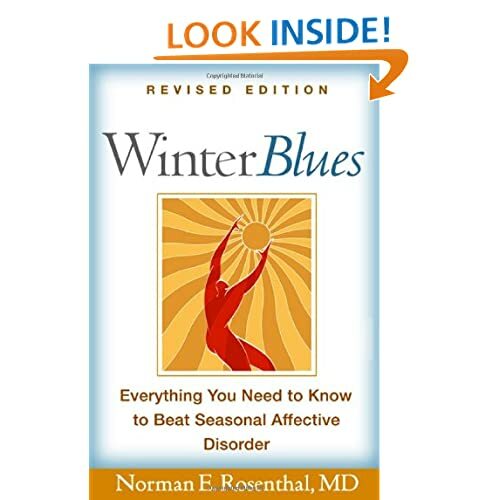 However, one can never predict when one will find a good and helpful book, and I submit this now as a way to ‘plan ahead’ and, if you or someone you know/love struggles with seasonal depression, this book can greatly help to alleviate the suffering that goes along with Seasonal Affective Disorder (SAD) or its milder cousin, ‘winter blues’. I learned much about the history of this disorder, which is now recognized by the diagnostic tools of the mental health profession. Once not understood, mis-understood, or ignored, seasonal depression is now more widely recognized and those who are affected by it have a real chance to regaining half their life. Half their life? Yes, indeed. As the book describes, and its suffers attest, it feels like they are lost, or absent, for about half their life. The winter half. The book presents the history of research and discovery, the treatment options available, and some self-assessments as to the severity of seasonal depression a person is experiencing. I especially appreciated the chapter outlining how to assess the seasonal ‘swing’ of children and adolescents: is it normal, is it the ‘winter blues, or is it SAD? The book is readable in style, without being overly academic or tough. It really gave me a lot of hope to read it, both for myself (more on the ‘winter blues’) side, and several loved ones that I know suffer from the more serious form, SAD. Rosenthal’s book simultaneously helps those who suffer from seasonal depression not to blame themselves, as they cannot control how many hours the sun shines in their neck of the woods, while empowering them to know that there are reasonable and reliable steps that they CAN take to alleviate or even totally remit their suffering.